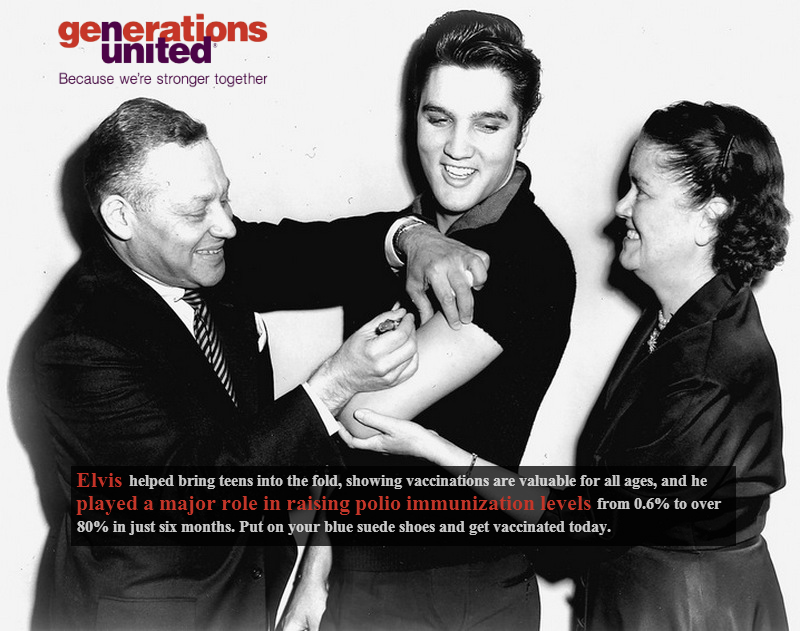 Happy Birthday, Elvis -- Vaccine Champion Extraordinaire! Elvis Presley rocked more than the jailhouse -- he rocked the vaccine world. Elvis, who would have been 81 on Jan. 8, calmed suspicious minds when he took a break during rehearsals at the Ed Sullivan Show in 1956 and got the new Salk polio vaccine. 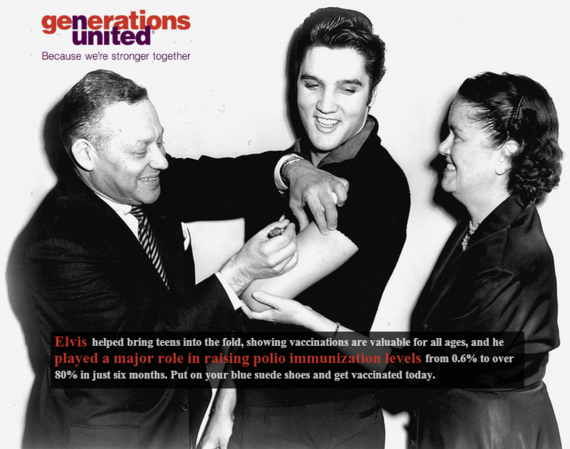 He didn't get all shook up or need blue suede shoes, blue Hawaii or a blue Christmas to know the new vaccine would have a tremendous impact on the health of future generations. He was right. Polio immunization rates rose while the rates of polio decreased following his famous shot. That's all right. You can't help falling in love with the man who led by example and shined a spotlight on the importance of preventing preventable diseases. He's always on my mind when I think about the value of vaccinations across the life span, from birth to old age. Perhaps today if he were alive he'd say don't be cruel and don't be a spreader. He would want to be sure his grandchildren were protected and healthy. As a responsible grandfather, he'd stay out of heartbreak hotel and get his shots. He'd also talk with them about why he was getting vaccinated and why they should too. Only a hound dog with a wooden heart would want to give the gift of illness to their grandchild, grandparent or grandfriend. It's the devil in disguise. Especially when we know there are three illnesses that can be passed between older and younger generations -- flu, pneumonia and whooping cough -- all of which are preventable with immunizations. It's now or never. Take time to talk with your family members of all age about the importance of vaccinations. Is that too much to ask? Elvis had an impact. So did one retired and senior volunteer program in central Texas. For 10 years older adults were educated and placed in health care organizations as childhood vaccination champions. They focused on educating parents who didn't have the firsthand experience they had with the devastation of diseases that are now vaccine preventable. Over the course of the program, 250,000 infants were enrolled and 500,000 reminders for boosters were sent to parents. What a way to love me tender. Follow Elvis's lead. Don't be a spreader, get vaccinated today. And yes there are 17 references to some of the King's greatest songs in this post. Did you find them all? !